Samsung Galaxy Note 8 to feature Infinity Display, will launch with Android 7.1.1 installed? Will the Samsung Galaxy Note 8 come with an embedded fingerprint scanner as this mockup suggests? Last week, we showed you a video that allegedly revealed the large front panel belonging to the Samsung Galaxy Note 8. Today, a new report out of the Netherlands suggests that the phablet's 6.3-inch screen will have the same edge-to-edge Infinity Display as the Samsung Galaxy S8 and Samsung Galaxy S8+. That means that the larger screen on the Galaxy Note 8 will keep the same 18.5:9 aspect ratio found on Sammy's latest flagship models. That is considered a better ratio for watching videos than the 16:9 aspect ratio found on Samsung's 2016 high-end models, including the twice-recalled Samsung Galaxy Note 7. Unknown at this time is the resolution of the screen. It could keep the 1440 x 2960 resolution used on the Galaxy S8 and Galaxy S8+, although there is some speculation about a hike to 4K. Also unknown at this time is whether Samsung was able to work out the problems it experienced trying to embed the fingerprint scanner under the front screen. The technology was not perfected in time for Samsung to embed the biometric reader in the Galaxy S8 and Galaxy S8+, which is why the scanner was awkwardly placed next to the rear camera on those models. The Samsung Galaxy Note 8 is expected to have Android 7.1.1 pre-installed and a dual rear-camera setup when it is launched later this year. The phablet could be unveiled during the IFA 2017 trade show which starts on September 1st in Berlin. Please give us a big battery. They won't, cause they're playing "safe" after what happened with Note 7. It'll likely be thesame or a smaller size than the s8+ because of the s-pen. They will just give you a small incremental increase at best. From a business perspective its better and lower cost to increase it by a small amount each year or so such as 100mAh or 200mAh rather than 500 or 1000 mAh. Otherwise, if they give you a 4,500mAh battery they are making things very difficult in the future to improve. But if they give you 100mAh each year, its very easy to improve over 10 years and it looks good on paper either way. An increase is an increase. But year a big battery would be great. Just not feasible. They never release it with the latest Android version. Thats a bummer tbh, although it all depends on if android O will have been out by then. No, but they made it super thin because, uhhh .... well because. I would love to have a thicker phone with @ 5000mah under the hood. That might take place of the replaceable battery we've lost. There are battery cases that provides your phone with the additional 2k mAh; why don't you buy one of those, if you want 5k mAh?! Android O will probably like N be first on LG V30, Pixel 2 and Mate 10. But maybe with project treble, updates to current Nougat devices will be speedier. Nothing new. For a few years now Galaxy Note is just a Galaxy S with S Pen. So the screen proportions will be the same. And phones with Android O out of the box will start showing up not sooner than in October. The galaxy note has always been an s series with a pen tbh. The only difference has always been the screen size. Even the pen has extremely limited uses and is less accurate and slower than typing too. Every other feature it has can be easily put into any phone without a pen. Just like they did for the galaxy s8. I've never noticed my pen being slower onmy Notes than compared to no option for handwriting, sketching, or just lazy table navigation from every other phone made without an S-Pen. My S-note drawings, meeting notes, and quick scribbles number in the thousands because I'm one of the users who appreciates the pen functionality. Reminds of that old car marketing slogan "It's a Jeep Thing. You wouldn't understand". For those who either don't understand or don't need the S-Pen, then it makes no sense. It's all right. Don't worry about it. Bankz knows how good the S-Pen is, he's an Apple troll tough. I honestly dont see any see anything exciting about the s-pen except for drawing tbh. There's a reason other oems have refused to follow. I only used to like it because of the spec bump, which they hardly do now anyway. 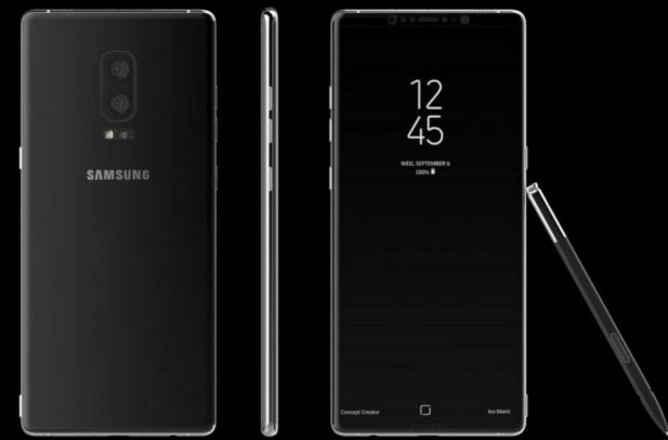 The only reason they will even be putting a dual cameras and increase specs in the note series now would be because they will want to revive the note's image otherwise, i just dont find anything interesting bout the galaxies anymore, especially the notes. I'd rather go with the premium iphone, the cheap oneplus or the exciting LG Vx series. What exactly makes the iPhone more "premium" compared to the S8 and the Note? Nothing actually. Lower rez screen, just made the jump to 7000 series aluminum, just made the jump to 12 meg camera, no headphone jack, no wireless charging, and Samsung makes several of it's components. Yeah, its much more premium than a Galaxy. Well said.. I was always using my note 5 pen. Funny how you complain about the Note series being "just" a blown out version of the S series (which is not true), yet you never complained about the iPhone's Plus models which are oversized versions of the regular iPhone. Double standards maybe? How many times do u see me on here bragging bout the iphone+ (as against the regular iphone)? Even at that, it has a far bigger screen, far bigger battery, dual cameras, ois, and landscape mode to actually differentiate it from the regular iphone and the disparity will even be bigger with the iphone 8. Next!!! 1. Bigger screen on a PLUS model is obvious, and isn't a differentiating feature...It'sobvious 2. Bigger battery on a PLUS model is obvious, and isn't a differentiating feature...it's obvious 3. Dual cameras is a plus, and is a feature 4. The smaller one has ois (on the 7, and should've had it all along) 5. Landscape is a dud, but mmmk, it's a feature. Or how the iPad is a blownup iPod Touch.